Stuck In The Buckosphere: Mobile update: from my patio. Mobile update: from my patio. I am dreading the cold temperatures so even though it is raining a little I opened up the umbrella on the patio and living it large. I was fortunate enough to ride my moped yesterday and today. It took a little while to go over the ped to make sure it was road worthy after the loose gravel incident, but all is well. While I was working on the bike, I noticed a little surface rust on the front brake. The bike have been sitting for an entire month while I was moving up to Columbus. I didn't think much of it, but when I went to stop for the first time, I went over the handlebars. Luckly I was only going about 3 or 4 miles per hour and I was able to catch myself. Apparently that surface rust is pretty sticky stuff. Anyway my ride was smooth sailing after that. 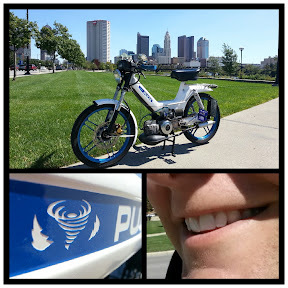 I rode around downtown Columbus and ran a few errands. 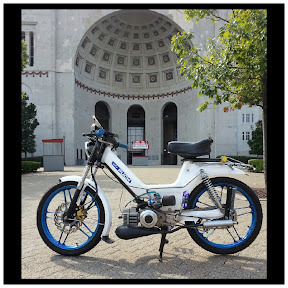 Today, I picked up my moped and rode it back down to the Short North to get my haircut. I absolutely love riding in a city setting. After my haircut, I rode my moped around campus. It brought back a lot of memories and I still need to go back and visit some of the people I know still on campus. So anyway I came home, cleaned the house, and now I am sitting outside relaxing....not looking forward to the colder temperatures in a few months. Speaking of temperatures. We will basically be seeing highs in the mid 70's for the rest of the week and staying gloomy. There is a chance for a hit or miss shower every single day for the rest of the week as well. Luckily no huge change in the weather pattern, meaning no big cold blast of air anytime soon. Keep your umbrella handy and have a good one. Signs of Fall and a game...for YOU!